You can cook just about anything in a cast iron pan – meat, vegetables, even cake and cornbread. 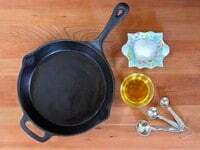 As the name suggests, cast iron cookware is made from a molten hot alloy that is poured into molds, or casted. You can find the pans in all shapes and sizes and in an assortment of baking molds, from corncobs to hearts to stars. Cast iron is built to last and if you know how to take care of it, you can use the same pan for an entire lifetime. The history of cast iron cookware goes back at least as far as 6th century China, but we are perhaps most familiar with its history in Colonial America. At this time, the majority of cooking was done in a hearth. Cast iron’s ability to hold high and even heat for an extended period of time made it ideal for cooking over an open flame. The handles on the pans allowed cooks to hang them above the fire. 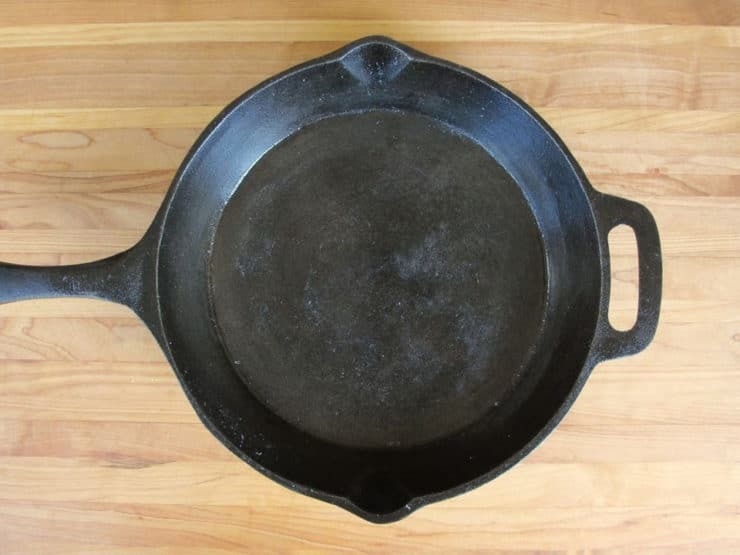 Because of its popularity, cast iron cookware was manufactured in huge quantities, which is why we see so much of it being sold at vintage shops and antique stores. You can get a great used cast iron for around $10 (sometimes even less). Clean it up, season it… good as new! 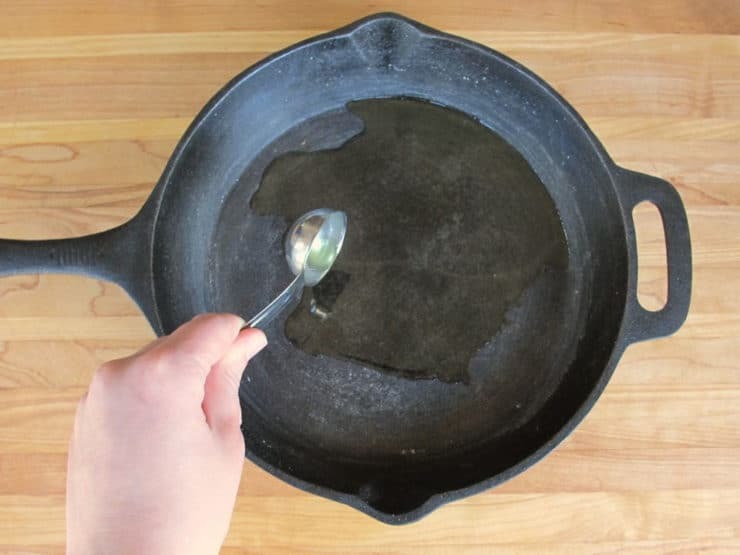 Here I will teach you a simple technique for cleaning and seasoning your cast iron pans. If you are in the market for a new cast iron pan, check out my recommendation below. 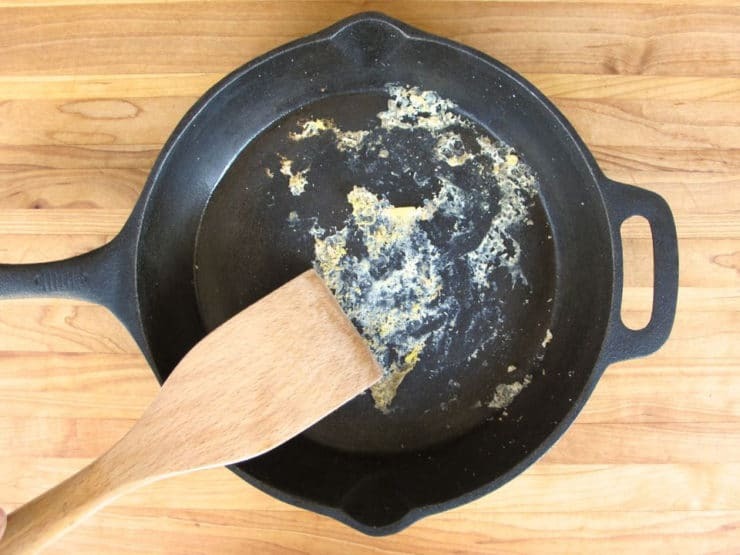 Do you cook with cast iron? 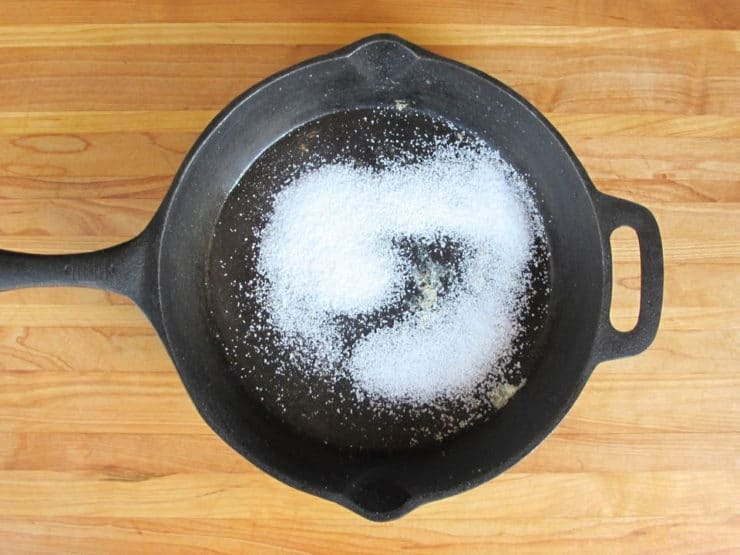 Share your cast iron tips in the comments section! Having the perfect seasoning on your pan makes it completely nonstick! Preheat oven to 400 degrees F. Start by using a spatula to scrape any food residue from the surface of the pan. 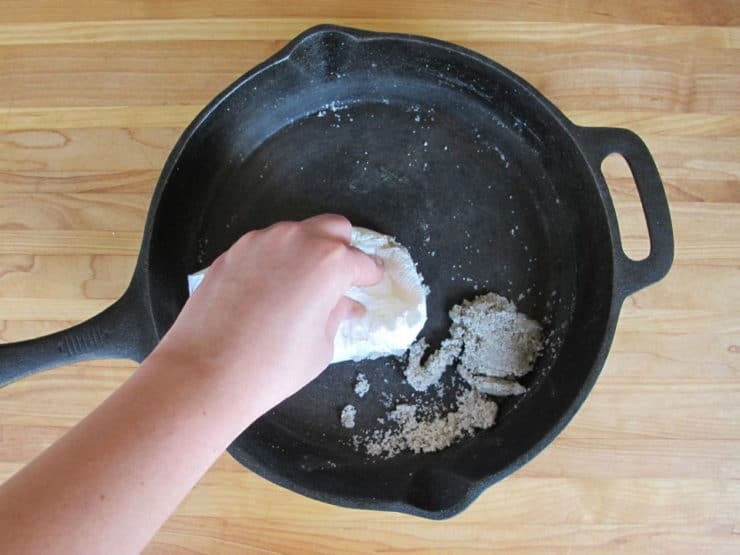 If your pan is mostly clean it can be wiped out with a damp cloth. 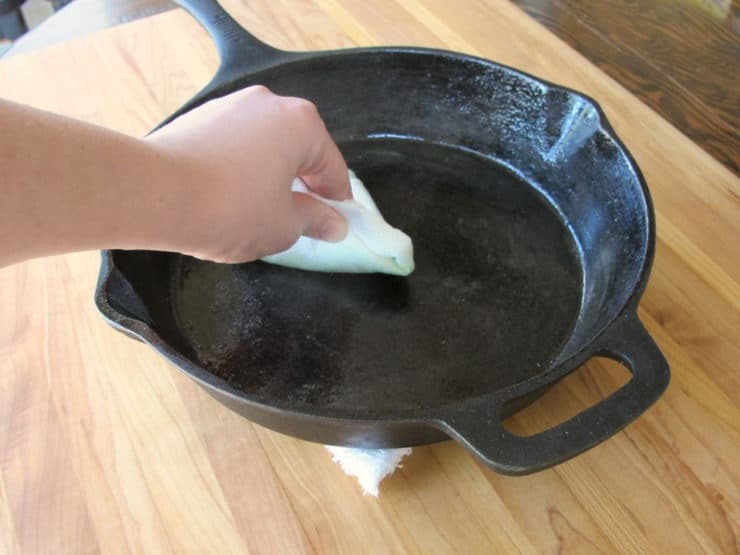 Never use soap on your cast iron cookware. Sprinkle the salt into the pan. 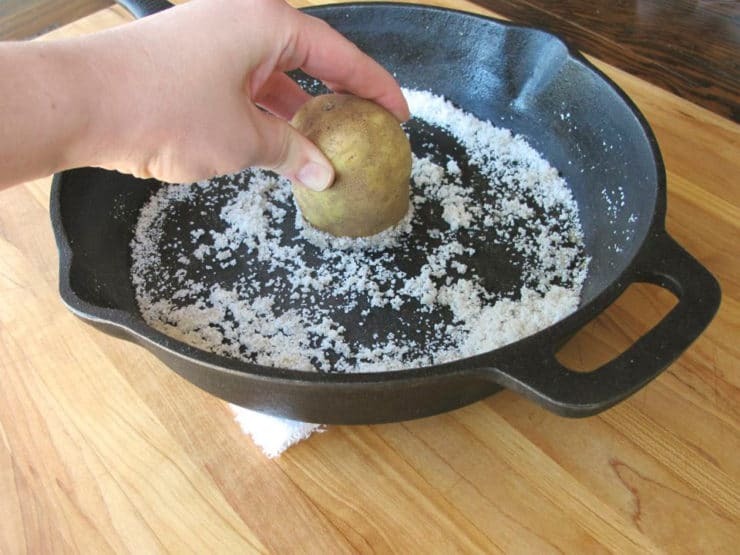 Using the flat side of the potato, scrub the salt into the surface of the pan. The moisture from the potato, combined with salt, helps to remove any debris or rust that cannot be eliminated by simply wiping out or scraping. Use a slightly damp paper towel to wipe the salt from the pan. Once the salt has been removed and the pan is dry, pour in the oil. With a paper towel wipe the entire surface of the pan, including the inner sides, edges and handle, with the oil. The surface should be lightly coated in oil, with no excess oil pooling anywhere. Wipe out all of the excess oil before placing in the oven. Once the pan has been thinly coated with the oil, place it in the oven at 400 degrees F for one hour. Allow the pan to cool and wipe out any excess oil that may be left behind. For pans that have been completely stripped of their seasoning, you may need to repeat the oiling and heating process multiple times to build up a thicker layer of protection. Do not use too much oil on the surface of the pan-- it should be thinly coated, not dripping. Once your pan is cool and you've wiped out any excess oil, your cast iron is cleaned, seasoned and ready to use! Every time you cook with oil in your cast iron pan (deep frying, sauteing, etc.) you will continue to build the non-stick coating, making it better with age. You do not need to re-season your pan each time you use it. Once you've cleaned it after cooking (using the instructions above), wipe it with a thin layer of oil before storing. This will help to keep the seasoning intact between uses. Re-season the pan once every 15-20 uses, or whenever you start to notice foods sticking more and/or the seasoning wearing away. Thanks for that great post amazing blog its very helpful for me. Wow! The salt and potato worked wonders! My pan is restored and now (hopefully) better seasoned for its next use. i actually use sand paper on my pans after a while and take the entire lot off…then season thing is with sandpaper you have to use it until it goes dull and this kind of polishes the surface so there are no deep scratches…..
a cast iron pot can always be reconditioned even when in a terrible state. I found an old cast iron skillet that someone had stored onions in. They had started to rot, and, scrub as I might, I can’t seem to get thin coating off of skillet. Seems to be a part of it now. Any suggestions? I have a Lodge griddle to use on top of an electric cooktop. I found it extremely hard to clean the nooks and crannies. Will the potato/salt get into those little cronies? Any ideas on modifications to this? Additionally, you said never clean with soap. Why exactly? I have to admit that I have already used soap, BBQ oven cleaner , wire brush and Brillo on this griddle. Have I ruined for good? You likely have not ruined it, but it is going to need some TLC. Though that oven cleaner has me a bit concerned. The cast iron is not porous in the same was a sponge is, but it is not perfect and contains many peaks and valleys. When you apply soap or some other cleaner to unseasoned iron, it gets into these valleys and can be difficult to remove. But if it is already seasoned, soap will simply ride along the surface. But that oven cleaner likely was able to eat through the seasoning. But that cleaner, since it is being used in cooking areas, should be able to be rinsed clean with water. When I absolutely must start over on a cast iron pan, I’ll put it in an oven on a self cleaning cycle. This will take it down to the bare iron. You’ll have all sorts of dusty residue (will look like rust). Wash it off, will take some elbow grease. Dry it off in the oven at the lowest temp setting (usually around 175f). Once cooled, use your bare hands to rub a high smoke point oil into the pan. I prefer flax oil, but it doesn’t matter which kind other than that it has a high smoke point. Once covered, use a clean towel to wipe off any excess, and place season in the oven as described earlier. If you use flax, you might want to go a bit higher for a bit longer (I normally do 450 for 3 hours). Once it cools, feel around on the surface. If you feel sticky spots, put it back in the oven for a while more. When you say griddle, do you mean the one that has the grooves to simulate grill marks? If so, the potato and salt will work, just make sure you keep the potato facing the same direction the whole time. The surface of the potato will work down into those grooves as long as you keep it going the same direction. I googled to see if a rusty steel Paella pan can be saved and I was directed to this site. Can this same method be used for my pan (salt, potato, oil, baking) to make it usable again?? Steel and cast iron are two different materials, I’m not sure if the same method will work well for your paella pan. Another benefit to cooking in cast iron is for health. One thing the midwife I work with suggests when a mother’s iron is low, is to cook as much as she can in a cast iron pan to help raise her iron levels. The oil your using is burning, use an oil that can handle the high temperature, such as flax oil.